I Am Beating MS: I Am Beating MS Facebook! The I Am Beating MS Facebook page has officially launched! This is a public page that will show up in your news feed for all to see. I will be posting the weekly, Wednesday posts as well as some inspirational stuff, articles, videos, etc. - anything that I think can help you on your Beating MS journey. This is a community page, so I hope you guys interact with each other and me. We're all in the same boat and here to help one another, so let's get talking! Now, if going public isn't your thing, I also run a secret support group, Beating MS! on Facebook as well. So secret, you can't even search for it. Only members can see the group, who's in it, and what members post. Its purpose is to inspire & give support! The founding principle of the group is beating MS through diet (same as I Am Beating MS) - specifically a whole-food, plant-based, oil-free diet as well as providing daily inspiration. Some of us are doing the diet alone, some are doing it with MS medications, some of us are new and just learning, some of us are still figuring out what works best, but all of us are open minded to the concept & being supportive. If you would like to be a part of Beating MS! 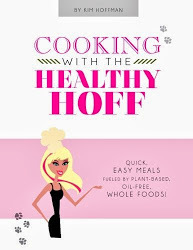 send your email address to Kim@healthyhoff.com (I promise not to sell it or even save it.) Because the group is secret, I will have to invite you to join via email. Hope to see & chat with you guys soon!